It seems we're not through with new Chromebooks yet. Google's tagline for their lightweight PC operating system initiative is "Chromebooks for Everyone," and to that end they are racing to the bottom when it comes to price. 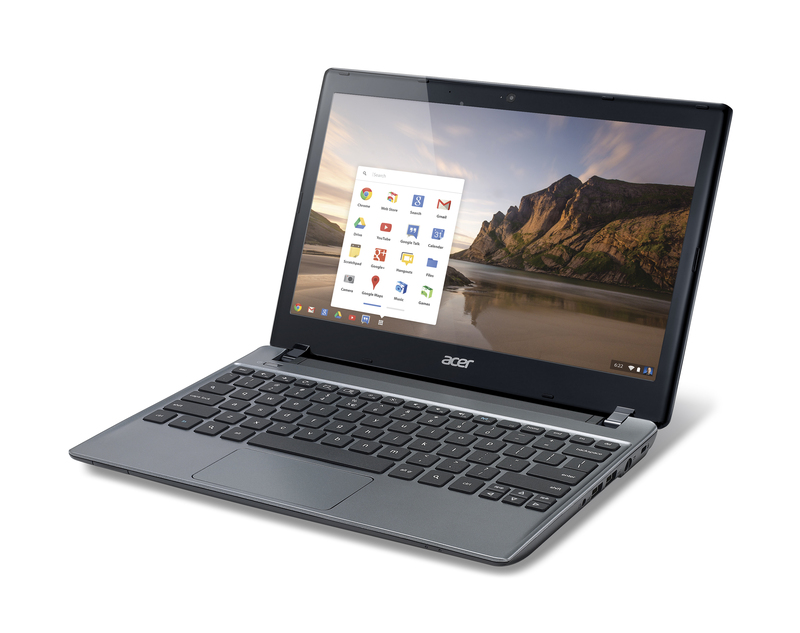 The latest new Chromebook, comes from longtime Chrome OS partner Acer, and is dubbed the C7. Where the latest Samsung Chromebook is notable for its ARM architecture, the Acer C7 is a much more traditional choice, whose primary goal was containing costs. But when low cost is the target, sacrifices are made. Firstly, the comparison point for this device shouldn't necessarily be its immediate competition, the new Samsung Chromebook, but rather that notebook's immediate predecessor the Samsung Series 5 550. This was the flagship for the last generation of Chromebooks and was notable for its Intel Core-based Celeron 867 processor, 4GB of RAM and capable 16GB NAND storage. The improvement in performance over prior Chromebooks was palpable because of the increased CPU and GPU performance. The Acer C7 is, generally, a step back in all specifications. The processor is the slightly slower Celeron 847, the RAM drops to 2GB and the NAND storage is omitted in favor of a traditional mechanical drive. The 320GB mechanical drive is the biggest concession to cost savings, as it makes almost no sense for an OS so clearly focused on the cloud. It also likely contributes to the battery life penalty this iteration takes; a paltry 3.5 hours, hardly a road warrior then. And if this looks at all familiar, it's because you previously came across the Acer Aspire One AO756-2641. That Windows 8 netbook matches the C7 down to the design and the sub-4 hour battery life. But the reward for all these concessions? A price of just $199, less than half what Samsung's Series 5 550 goes for still, and slightly more than $100 below the Windows iteration. The price includes 100GB of Google Drive for two years, and 12 GoGo inflight WiFi sessions, and is surely the cheapest way to a Core-based system, even if it is a Celeron. One thing is clear, no matter the market, Google intends to compete if not dominate on price. And if that means better gear at lower prices, there's little room for us to complain. Celeron is noticiable faster than exynos. The Acer has a mechanical HDD which is a lot slower than the SSD on the $250 ARM Chromebook, and this slows down a lot of operations - case in point the ARM device has a 10 sec book time compared to an 18 sec boot time for the Acer. This will considerably slow down a lot of operations as some reviews have noted. The Acer is also clocked at 1.1 GHz instead of 1.3 GHz for the Samsung 550 Celeron Chromebook, and has 2GB of RAM instead of 4GB. This will mean the Acer is slower than the Samsung device benchmarked. This is not Netbook Atom CPU, but a proper Dual Core SandyBridge 1.1Ghz CPU. Intel actually has very decent Linux Graphics Drivers. If you think of it as purely not as a Netbook, Chromebook, but a Notebook with Media And Internet function this seems like a good deal. For those who use it only with Office Work and Internet browsing. I really want to see a break down of this - including if it is possible to get an SSD in there. The prices at the budget end of the Windows laptop market seems to have crashed very recently. These machines cost a lot more a couple of months ago. This would seem to indicate that the Acer Aspire AO756 and other budget Windows laptops and netbooks aren't selling, and are being sold cheap to clear surplus stock. The fact that Acer's $199 Chromebook is a re-purposed Windows laptop with a 320 GB HDD more appropriate to Windows and a lousy battery life rather than one with 16GB SSD supports this.